Chinese restaurants first opened in San Francisco about 1849. This date is given because one year earlier, when gold was discovered, four hundred fifty-nine people lived in San Francisco and very few, if any, were Chinese. When the Chinese did come, most were men. Theirs was a bachelor society and purchasing cooked food was probably important to them. When these immigrants did open restaurants, their places looked western on the outside; big ones had Chinese furnishings within. To broadcast their ethnic identity, many hung yellow tri-corner silk flags on the outside; some also used Chinese characters signs or on these flags. Larger restaurants provided stools, tables, and a few chairs for eating; smaller ones probably only had benches. The bigger ones needed more than one or two persons to prepare and cook their foods. More than likely, they made formal banquets and informal meals. One report indicates a full meal costing an entire dollar, a dish or two very much less. By 1856, five large Chinese restaurants were available, recognized by their silk flags. Some thirty years later, in 1882, fourteen Chinese restaurants are listed in a Chinese business directory. So are one hundred seventy-five Chinese laundries, seventy-seven Chinese-run general stores, and sixty-two Chinese groceries. That same listing indicates sixteen Chinese-run butcher shops. Reported elsewhere is information that opening one restaurant can cost as much as opening thirty laundries. 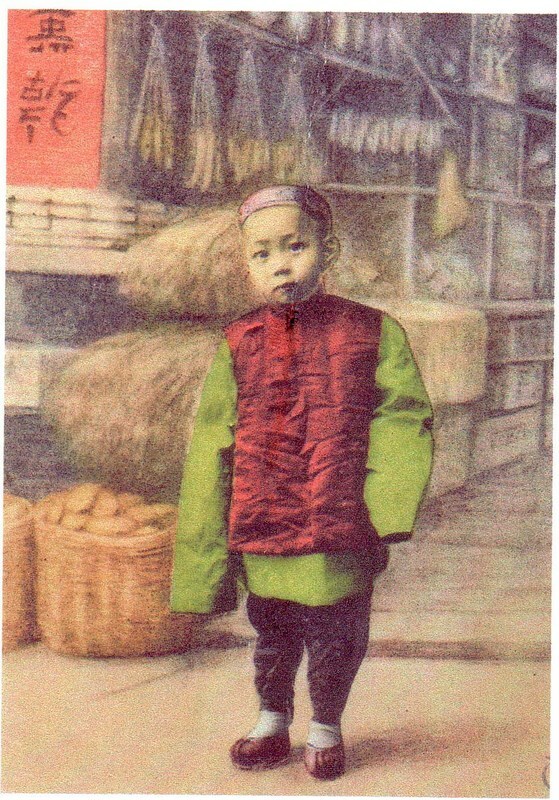 In the early gold rush years, Chinese restaurants catered to all kinds of people. One person wrote that they attracted folks liking "curries, hashes, fricassees, genuine English dishes, and tasty potato concoctions." Another said "tea in Chinese restaurants is the best in the city." A third said: "Meals are a dollar each without regard to quantity." Were these the first Chinese buffets, or were the writers just delighted at their huge portions; we do not know. In 1850, Mayor Geary welcomes the Chinese in San Francisco’s Portsmouth Square. Unfortunately, that welcome was short lived. By 1852, many Chinese feel uncomfortable by the pro-America movement; it generated considerable racial tension. So elevated is this tension, that few westerners enter or eat in Chinese restaurants. The latter mostly cater to Chinese customers. Between 1873 and 1906, Chinese restaurants become recognizable by their painted balconies and the aforementioned silk flags. In the 1880's Chinese restaurants shift their market forces to attract non-Chinese customers. Some add Chinese lanterns with or without tassels. The bigger ones sell Chinese foods and other goods on their street floors. This can be seen in a 1904 picture on this page thanks to Alice Ross of Hearth Studios, Smithtown, NY. She is a food historian whose extensive early postcard collection is where we located it. This big type of eatery has tables for their diners on the second and third levels. Most of the eaters are still Chinese. Large parties find themselves secluded behind wooden screens. Large or small, these groups eat at marble or marble-looking tables. In 1859, ninety-five percent of the Chinese restaurants are in Chinatown, all forty-four of them. Between then and 1890 a few curious non-Chinese folk take a look at or in them; but most avoid even that, unless on a tour. At best, during these times folk gawk but do not patronize these Chinese food places. A few brave souls, virtually all men, do venture in; very few try the food. Most believe what one author wrote about these restaurant menus; he said they are "composed of all sorts of repulsive things." Another popular thought says that "Chinatown is synonymous with vice, depravity, and dirt." Were these sentiments not enough, in 1906 there is a devastating earthquake. A dozen Chinatown blocks are leveled. What is left is only rubble. Then believe it or not, things get better the following year when three hundred buildings are rebuilt. A few are Chinese restaurants. It is only after they open that Chinatown begins to seriously recuperate. Then, it actually becomes the jewel of San Francisco and a huge tourist attraction. The earthquake was so devastating that many Chinese fled the downtown. They move to Richmond, Oakland, and other suburbs. A few of their favorite Chinese restaurants, those consumed in the fires that broke out during and after the earthquake, are in need of rebuilding. Some do so downtown, but many leave there and follow their customers to the suburbs. With so many Chinese people and Chinese eateries no longer in Chinatown, ill feelings manage to decline. That and Chinese eating habits are beginning to change; they become change agents. Dining habits of non-Chinese also change; and now they both start to dine in each others eateries. The Chinese begin to adore coffee and hamburgers. Some of their restaurant menus reflect this. One or more offer a dish called 'Hambork Fan.' Not a regular hamburger on a bun, this is a hamburger fried in soy sauce and served over rice. It becomes popular among both populations. So does Chop Suey and Chow Mein among those not Chinese. The Chinese delight in visiting 'Jook Shops' to have their congee. These small eateries also serve fried noodles, and a myriad of soups. The Jook Shops cater to those working long hours; a few attract late-working non-Chinese customers, and they, in turn, appreciate them for their fast service, low prices, and being open from dawn to three the next morning. In 1924, the first Chinese night club opens. Called Mandarin Chef, it is at 400 Grant Avenue. Harley Spiller wrote about dining, drinking, dancing at Chinese nightclubs, then concentrated on a diva in the Chinese nightclub known as The Lion’s Den (See Flavor and Fortune's Volume 9(3) on pages 11 and 12 and 27 through 29). The Mandarin Chef went out of business during the depression; it did come back called the Kubla Khan; that was a few years later. These nightclubs had Chinese singers, musicians, fan dancers, and the like. One called New Shanghai Low on Grant Avenue opened in 1936. We read about two others, Twin Dragon at 158 Waverly Place and Chinese Village at 776 Sacramento, and there were others. Food at them and most Chinese restaurants outside of Chinatown by this time is now more American than Chinese. By 1945, restaurants touting 'authentic Chinese Food' are less and less Chinese. One reason, more Chinese work and live outside of Chinatown and younger Chinese who run or frequent them have little experience with real Chinese food. Dim sum, though popular with some, does not catch on with others. This lack of interest in 'real' Chinese food is exacerbated with fewer Chinese food imports because of World War II. After the war, to increase business, Chinese restaurant owners unite and form a Chinese Restaurant Association. They hope to improve quality and increase quantity of sales. By the 1960's, they and others are aware that Chinese children do not know their national language and they prefer eating hamburgers and hot dogs to Chinese food. Lack of interest in things Chinese changes with the lifting of immigration quotas in 1965. After that date, Chinese restaurants grow in number as does the Chinese population. Chinese restaurants in this and other cities show unprecedented regional diversification. Chinese markets and Chinese eateries offer greater varieties of Chinese food; there is now greater numbers and kinds of Chinese food available for purchase. Overall, Chinese culture is reemerging in San Francisco and in cites and towns throughout the United States. The looks of Chinese restaurants begin to change. In the 1960's, those in San Francisco start to look Chinese. Bland-looking places become stereotypical of Chinese restaurants everywhere. The yellow flags disappear as does much Chinese decor. The taste of food follows suit probably because more diners are not Chinese. The names of Chinese eateries meant nothing to Americans before, and they remain meaningless when Chinese restaurants adopt names such as Mandarin this, or China that. The only thing understood is that they are not Cantonese-–or at least most of their food is not. Post 1965, the word Szechuan becomes part of many restaurant names. Years later the word Hunan does likewise. Some of the dishes served are toned down versions of the foods of these provinces. In the 1980's, Hakka and Chiu Chow restaurant names and cuisines become popular. However, these places serve only a few dishes representing their cultural heritage. Shortly thereafter, Cantonese food and restaurant names come back into fashion. That, and more Chinese-tasting foods make comebacks. Better Chinese food, more Chinese restaurants, and more Chinese regional variations expand understandings of the depth and variations in many Chinese cuisines. With newer immigrants come recognizable Chinese objects in Chinese eateries. These include altars, dark stools and tables, inlaid marble, false archways, and scrolls of Chinese poetry. Those lucky enough to be invited to a formal Chinese banquet begin to enjoy tea and conversation in an ante room. Men are offered cigars while waiting for guests to gather and meals to begin. Places specializing in banquet cuisine have these ante-rooms. Everyone waits together until they usher guests to their dining tables. Ordinary Chinese restaurants do not have these niceties. Chinese food in San Francisco and elsewhere in the United States is considerably different from the way it was in the 1850's. In 2005, there are more than forty thousand Chinese restaurants throughout the United States. They come in all sizes and shape, and with all sorts of Chinese cuisines. Seven thousand are in California alone, a large proportion of them in the city of San Francisco. At this time, there are almost as many restaurants of other Asian populations in San Francisco and in California as there are Chinese restaurants. What is interesting is that some are run by Chinese from these other counties, many are not. Some only serve Chinese food from one province or Chinese city, others serve many different regional Chinese foods. Some serve Chinese food and the foods of several other Asian countries. Chinese restaurants are very different in these years than they were when they first started. What will they be like ten, fifty, or one hundred years from now? Anyone want to venture a guess? What other changes will take place in the United States in the years to come?